Gardener’s Nightcap by Muriel Stuart is a Persephone book which was originally published back in 1938. Muriel Stuart was better known as a poet apparently and Thomas Hardy described her work as being superlatively good. She was the daughter of a Scottish barrister and was known as a Scottish poet although for most of her life she lived in England. This is one of those books that you can dip in and out of, opening the book at random you can find an interesting half page on the subject of yellow roses or fragrant shrubs for the garden, leaf moulds or the autumn paeony. I found it slightly frustrating though as I’m sure that most of the plants that are mentioned have been superseded by ‘improved’ cultivars, so they’ll be unobtainable. There’s even a recipe for making your own rose oil, somewhat different from my efforts to make rose perfume as a wee girl, so the outcome might be better. Quite an interesting read but I think her earlier book called Fool’s Garden which was published in 1936 and was a bestselling book about creating a garden might be even more interesting for serious gardeners although I suppose again many of the plants mentioned would be unobtainable. 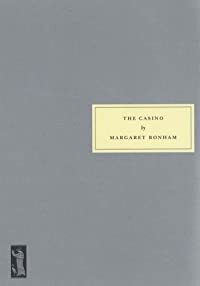 The Casino by Margaret Bonham is a collection of short stories published by Persephone Books. I had never read anything by the author before. I’m not averse to short stories, I think they’re especially good for bedtime reading, but I wasn’t too impressed with this collection, although I think towards the end of the book the quality of the writing improved. To me the earlier stories were mainly uninteresting, verging on the boring or meh as they say nowadays. I have no idea when any of the stories were written but I’m assuming that the later ones were written when she had more experience as they are better. I read the preface which is by Cary Bazalgette, the author’s eldest daughter. It is a mini biography of her mother and she paints such a ghastly portrait of her that I think I was really put off. Margaret Bonham was one of those women who abandon one husband and family to run off with a man and start up another family – only to repeat her actions again. That and her eight bottles of gin a week habit that didn’t ever stop her from driving – I found rather off-putting. I KNOW, very judgemental of me – but there you go, or there I am. On the other hand, some of her stories are quite entertaining. For a week now our home has been a bit of a centre of misery as we’ve both had rotten colds. Jack got it first and generously passed it on to me – share and share alike! With explosive sneezing bouts occurring frequently we’ve both been too exhausted to do anything much, but when I’ve had the energy I’ve been reading. But decisions, decisions – what should I read? I tried The Black Arrow by Robert Louis Stevenson. It’s on my list of Scottish books to read for the Read Scotland 2017 Challenge. But I only got a couple of pages into it before realising that my brain was not going to cope with the medieval style of English that it seems to be written in. I gave it up intending to go back to it when I’m back to normal. I then picked up A.J. Cronin’s The Citadel, but the subject matter of medicine and Harley Street doesn’t appeal to me at the moment. So I put it down again. I couldn’t find my copy of The Young Pattullo by J.I.M. Stewart – so opted to start reading Good Evening, Mrs Craven: The Wartime Stories of Mollie Panter-Downes. It had just dropped through our letterbox a few days before. It turned out that these short stories – often very short were just perfect for my mood. They were originally published in The New Yorker magazine, giving people in America a flavour of what life was like for women in wartime Britain. There’s a date at the beginning of each story, presumably when it was originally published, the first one being 14 October 1939, so just a month or so into the war. The early stories are quite light-hearted and amusing but towards the end of the book nerves are getting frayed as food shortages and changes in life-styles begin to bite. This is the first book by Mollie Panter-Downes (I can’t help it but her name always makes me smile) that I’ve read, and I’ll definitely be reading more. This one just hit the spot exactly. I know that a lot of people prefer the original plain grey Persephone covers but I was particularly pleased that this one has as a cover which is one of my favourite World War 2 paintings, capturing what must have been the reality for people, women in particular, standing in queues for hours on end in an effort to get enough food to feed their family. 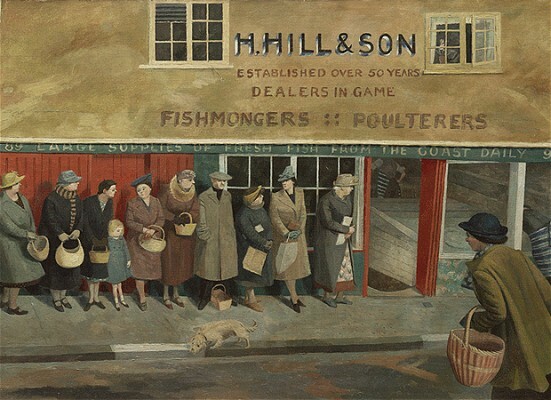 The painting is by Evelyn Dunbar. 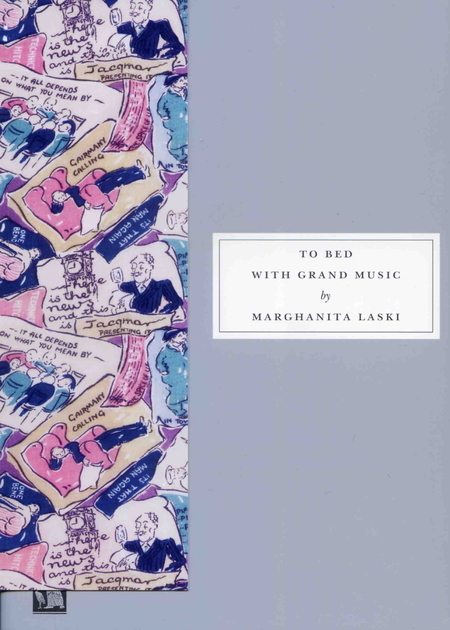 To Bed with Grand Music by Marghanita Laski was first published in 1945. It’s a very unusual book, for me anyway because although there aren’t really any likeable characters, it still manages to be a great read. Normally that’s a state of affairs that really puts me off a book as I want to be in the company of people that I would be happy to have as friends in real life. The book begins with Graham and Deborah Robertson in bed, Graham is in the army and he’s about to leave for Egypt. Deborah is miserable at the thought of being without him and she desperately tries to get him to promise to be faithful to her, no matter how long they are apart. Graham is unwilling to give promises that he feels he may not be able to keep, but he does promise that he will never form any relationships with any other women. In other words it would be ‘wham bam, thank you ma’am’. Deborah has to be satisfied with that but she swears she will never look at another man. Deborah’s mother Mrs Betts knows her daughter too well though and when she sees that Deborah is taking out her frustrations on her young son Timmy, the grandmother in her puts the child’s interests to the fore. Mrs Betts tells her daughter that she believes there are fundamentally two types of women in the world, the mother type and – the wife type. She hesitated over the second epithet, unable to say the word that was really in her mind. Basically Mrs Betts knows that her daughter can’t live without a man in her life, she is completely self-centred and is uninterested in Timmy. The upshot is that Mrs Betts is able to manipulate Deborah very easily, Deborah jumps at her hints that she might be better getting some sort of war work and leaving Timmy’s upbringing to Mrs Chalmers who is her housekeeper. A local job is not good enough for Deborah though, once she has made up her mind to do war work it’s only London that she’s interested in and she moves into her old friend Madeleine’s flat and Mady helps her to get a job. But Mady has a bit of a reputation and Deborah knows that Graham wouldn’t be happy about her living with Mady, so she keeps quiet about that and so begins a life of deception. In no time Deborah is being wined and dined every night in posh hotels and clubs. London was jumping during the war, especially if you had money. People lived life to the utmost, knowing that they could be dead at any minute. Deborah has turned into a ‘good time gal‘ and she is having a great time, manipulating men who are happy to pay her in designer clothes and jewels, allowing her to feel that she is doing nothing wrong, after all she’s not accepting any money. She is handed from man to man, as they are called away to various different spheres of the war. Deborah is briefly appalled at her own behaviour but in no time she is able to justify everything that she is doing. Anything is acceptable if it means that she gets all the material things she wants and is kept entertained by well off men. She’s a snob and a social climber, in fact she married Graham mainly because she thought his family was wealthier than they actually were. She dreams of divorcing Graham and getting married to one of her gentlemen friends, she has no inkling that the fact that she sleeps with them as soon as she is introduced to them means that she would be seen as completely inappropriate as a wife. In fact, she quickly ends up going way down the social scale. Meantime of course, Mrs Chalmers the housekeeper is looking after Timmy without so much as one day off in all that time. So you see what I mean about there being no likeable characters, unless you count Mrs Chalmers who is genuinely very fond of Timmy. Mrs Betts set her daughter onto that path in London, knowing exactly what would happen, she knew her daughter took after Mr Betts whom she had had trouble with early on in their marriage! Still, it’s a really enjoyable book. I believe that To Bed with Grand Music was reprinted by Persephone books but I borrowed a large print copy from my library, which was published by Isis.That word seems to pop up everywhere, and it used to have such pleasant connotations. If you mooch around second-hand bookshops you might find a copy of the book with the author named Sarah Russell, the name she originally wrote it under. Possibly this book was seen as being a bit much at the time of its publication, the complete opposite of the sorts of books that kept people going in times of war, light and uplifting tales where women were selfless and uncomplaining, but I’m sure that for a lot of people it was more realistic, perhaps too realistic for some to contemplate. A lot of people have been reading and writing about this book recently, so when I saw it sitting next to ‘Mrs Tim’ the other day in my local library I just had to borrow it. I was only supposed to be taking books back and NOT LOOKING – but you know what it’s like. It’s set in England during the 1930s and people like Barbara Buncle are finding things very hard indeed. Like many genteel people of that time she is living off the small amount of money that the dividends from her inherited investments pay out. Times are hard and consequently the dividends are poor. Paid employment is out of the question, buying hens as an investment is considered and rejected. So Miss Buncle decides to try her hand at writing a book and she uses her own village of Silverstream and most of its inhabitants as ‘copy’. She sends the resulting book Disturber of the Peace off to the publisher, Abbott and Spicer and Arthur Abbott decides to go ahead and publish. Miss Buncle has been a bit too faithful with her copy, in fact her fictional village Copperfield and its inhabitants are almost a carbon copy of Silverstream and so it isn’t long before the village folks are revolting! In the second part of Disturber of the Peace, Barbara Buncle decides to (write) right all wrongs by having a ‘golden boy’ walking through the village playing a reed pipe, and when people hear him it makes them do things that they wouldn’t have dreamt of doing before. In that way Miss Buncle herself takes the part of the golden boy of her book. But the villagers are still clueless as to who the author is and some of them are determined to get to the bottom of the mystery. The storyline is really clever and the whole thing is very funny, it’s a great comfort read. It was her most successful book although I really liked Mrs Tim too. D E Stevenson was a cousin of Robert Louis S. and so was part of that famous family of lighthouse builders/engineers. Dorothy called her books her ‘lighthouses’ and I think that they really must have been like that as she was so popular during the dark days of World War II she probably saved quite a lot of people their sanity. Had she been born a boy she almost certainly would have been a lighthouse engineer/designer, as I believe that R.L. was deemed to be a bit of a failure when he didn’t go into the family business. Although Miss Buncle’s Book is set in an English village, it wasn’t part of Dorothy’s experience as she lived in Scotland her whole life, moving from Edinburgh to Glasgow when she married and then eventually settling in the Border town of Moffat, where she is buried. Moffat is certainly a nice wee town, it’s a while since I’ve been there but as I recall it has a statue of a sheep in the middle of it and a shop which sells lovely freshly made vanilla ice-cream. Next time I go there I’m going to take some photos of the town and look for her grave. I hope the good ice-cream shop is still in business!